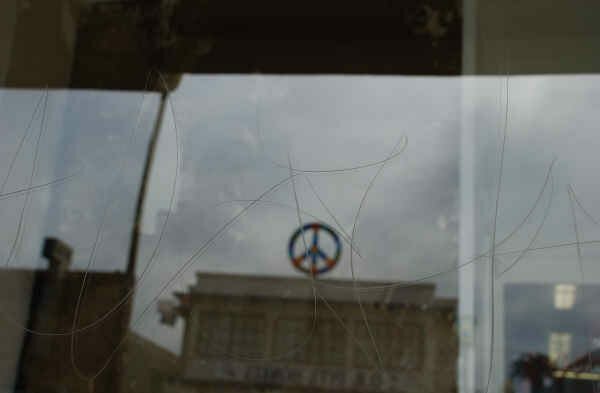 Business window vandalized with OB Peace Sign in reflection. Photo by Jim Grant. Editor: We will be posting an update on this story later today. By Jen Lebron Kuhney / SignOnSanDiego / Tuesday, January 25, 2011 at 5:46 p.m. OCEAN BEACH — The windows of at least 31 Ocean Beach businesses were etched by vandals, apparently between midnight and 5 a.m. Tuesday, San Diego police said. Sgt. Jack Knish said at least 94 windows on Newport Avenue between Sunset Cliffs Boulevard and Bacon Street were damaged with what he said looked like “letters and gibberish.” The San Diego Police Department’s graffiti unit will investigate to see if they can be attributed to known taggers. Knish said the damage will cost “tens of thousands” of dollars to repair. Police said some sort of pointed object, like a knife or screwdriver, was likely used to cause the damage. For the remainder of this article, please go here. Screwdriver or knife? That just sounds wrong. Something diamond edged like a glass cutter, tile cutter, ring, file, etc…. I have a glass cutting board, a knife hasn’t scratched it yet. Having lived in Colorado and actually used a screwdriver on occasion to break the ice off my car windows, I don’t see a screwdriver doing it either. It would have taken days. Let’s call the mythbusters! It has happend to us over here on Bacon St. This was a few weeks ago, so this last was not an isolated incident. Yesterday I spoke with a young man opening a business over on Niagra. Their newly replaced window had been scratched before it was completely installed. I hope they catch the the people doing this. Also there is a lot of new graffiti down by the pier cliffs area. It’s time to do another paint-out. SDPD were in OB last evening at 5 walking newport talking to biz owners and taking photographs. Every business on my block (4800) was hit. The shop across the street has 15 big plate glass windows that cost about $1000 each to replace. I”m wondering if anybody knows of a technique that can remove the scratches without needing to replace the entire pane of glass. Also, the Hydroponic shop and the dispensary have cameras that face the street. Maybe they have something we can look at. I’d just love to catch the $@*$ that did this. “Hi, I just caught wind of this, I own San Diego Glass Restoration. We repair and resurface damaged glass 100% distortion free. Id like to personally offer to knock $50 off repair for anyone this business was vandalised in thus event. Feel free to contact me personally if I can be of assistance to you, or visit our website. I run a glass graffiti removal business in Chicago, and I can certainly attest to getting your glass repaired instead of replaced. It will save you a ton of money over the cost of replacement. Also it is important to get the damage removed immediately so as to discourage it from coming back.